After weeks of rumors and a leak or two, Apple has finally unveiled the new true wireless – and water – resistant – Powerbeats Pro. The new features of the new Powerbeats are that they are 23% smaller and 17% smaller than previous workout earphones, plus an adjusted design that gives a better, more comfortable fit. There has also been a number of improvements to the in-house driver that Apple says will bring "incredibly low distortion and great dynamic range across the entire frequency curve." Like the new-and-improved Apple AirPods (2019), The Powerbeats Pro uses the Apple H1 Chip for hands-free Siri and will offer improved connectivity and a faster connection time. They also use two beam-forming microphones on each earbud to filter out external sounds such as wind and ambient noise as well as a speech-detecting accelerometer that's used to enhance speech recognition. In terms of battery life, Apple says that you can expect around nine hours from the headphones themselves, and around 24 hours of battery life when combined with the charging case. The headphones will automatically go into rest mode after a short period of inactivity to preserve battery life, and will automatically turn off when they are back in their case. 1; these should sound better thanks to the new acoustic housing and sound better when taking phone calls. They'll also last longer than before, too. The other feature that the fitness crowd might appreciate is that the headphones offer an hour-and-a-half playback from a 5-minute charge, and over four hours of playback from 15 minutes on the charger – perfect if you plan on working out but charge your headphones after your last gym session. 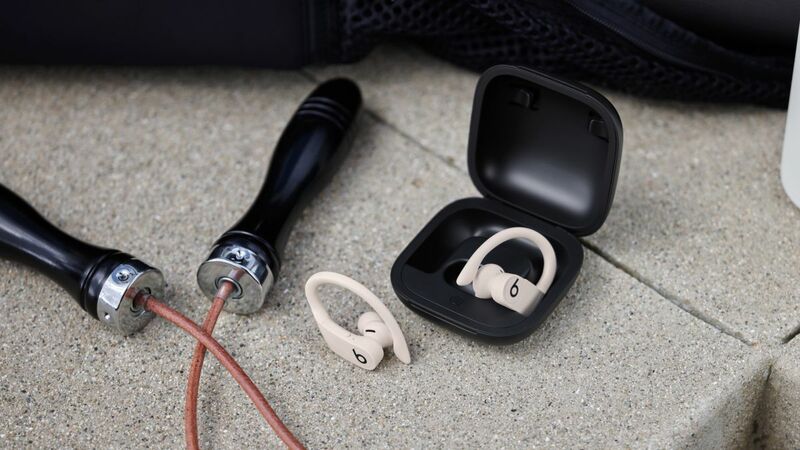 Like some other fitness-focused headphones on the market, the Powerbeats Pro have optical sensors that can automatically play / pause your music when the earphones are placed in or removed from your ears and allow you to quickly say a few words to your running mate without messing up your flow. The Powerbeats Pro are coming in May in four colors (Black, Ivory, Moss and Navy) with a price tag of $ 249 / £ 219 / AU $ 350.